A.C. Entertainment Technologies is one of the largest single-source providers of professional equipment and related services to the entertainment industry. Its four specialist product divisions supply to dealers, distributors and end users in the stage, theatre, touring, film & TV, events & exhibitions, corporate, education and architectural markets worldwide. In addition to its international headquarters just outside of London, it has a Northern sales office in Leeds and sister companies in Europe, North America and Asia. “We needed new and better quality projector for our programme of exciting productions before they head off on international tours. The EH7700 was the perfect unit for us." “It only took a couple of hours between getting the projector out of the box to having the image ready to go. The ease of setting up was great especially with our tight schedule." “We chose the EH7700 for the largest and most opulent space in our 80 room old town hall building because the EH7700 can be used by a range of shows in exciting ways." 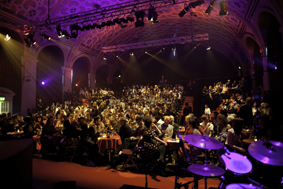 Challenge: Battersea Arts Centre needed a bright, cost-effective and reliable projector for its majestic Grand Hall that would be flexible for a wide spectrum of productions and content. Solution: Optoma’s EH7700 projector and WT2 (wide) lens, recommended by A.C. Entertainment Technologies, was hung behind a false arch at the front of the stage for its epic production, Orpheus. Results: The images projected in each scene were crystal clear due to the projector’s WUXGA resolution and brightness. The wide-angled lens allowed the centre to project onto different drapes during the performance and the flexible lens options and motorised lens shift, focus and zoom made installation incredibly straightforward and quick. Housed in a Grade II* listed old town hall built in 1893, Battersea Arts Centre is a place where artists, audience participants and staff can play a role in inventing the future of theatre. 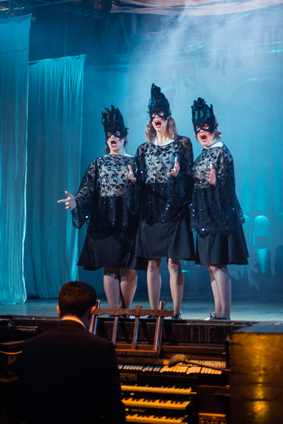 For a six-week London run, Battersea Arts Centre re-staged Orpheus in the building’s Grand Hall. Orpheus forms part of Battersea Arts Centre’s Gods, Myths and Legends season featuring mythical characters catapulted into modern day settings. 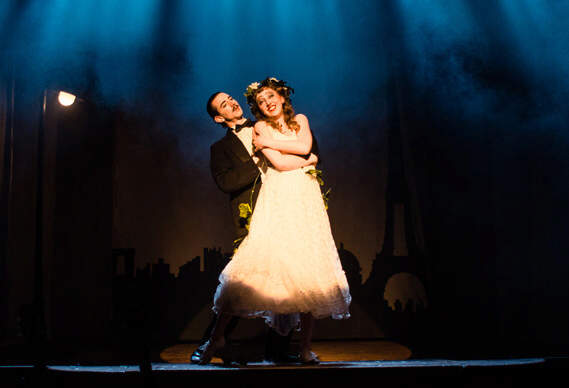 The epic co-production by Little Bulb Theatre ran from 8 April until 17 May 2014 and told the thrilling tale of Orpheus’ ill-fated descent into the underworld, set to a live score of hot club jazz, opera and French chanson. In preparation for the show, Battersea Arts Centre needed a bright, robust projector that could create stunning images on stage that would dazzle audiences seated across the 150 square metre hall. The organisation is also increasing the breadth and frequency of its programming for the Grand Hall and needed a projector that could cater for a wide variety of applications and content. And it needed to be cost-effective and reliable. A.C. Entertainment Technologies recommended the Optoma EH7700 projector due to its outstanding brightness of 7,500 lumens and the high definition imagery created by its WUXGA resolution. 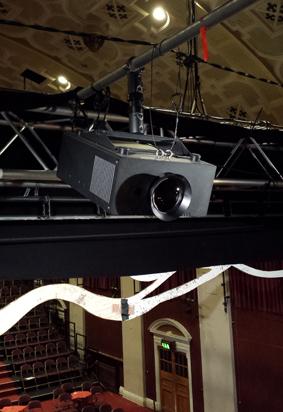 It was installed with the ProScene WT2 (wide) lens. The centre needed a wide-angled lens that was flexible enough to cope with the variation in throw distance when projecting onto numerous different drapes. The projector was hung behind a false arch at the front of the stage. The flexible lens options and motorised lens shift, focus and zoom made installation incredibly straightforward and quick. Thomas added: “It only took a couple of hours between getting the projector out of the box to having the image ready to go. The ease of setting up was great - especially with our tight schedule. 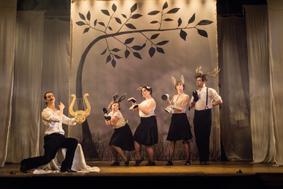 Image copyrights © Battersea Arts Centre. Orpheus image credit to John Hunter for RULER. Optoma ProScene EH7700 with WT2 (wide) lens.